The first hike I ever did with my children didn’t go very smoothly. 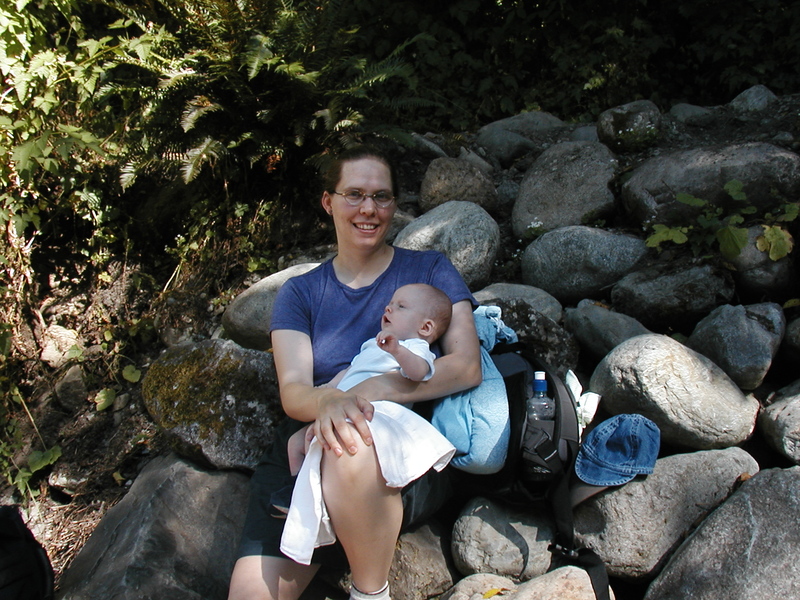 I carried my 8-week-old infant in a sling, and carried a gigantic fanny pack slung around the other shoulder. The trail I picked had too much elevation gain for my post-partum state. The baby had a huge blowout all over me, even dripping down onto the trail. And he cried the whole way there and back in his car seat. But in the picture I have of us on the trail, I am smiling, and he is looking up at the trees in wonderment. Our hikes got better after that, but it took me a long time to figure out what worked for our family, and that seems to change every year. If you are just starting out hiking with your children, here are some pointers to help you get started. Make sure you have enough food and water. Pack energy rich snacks, and have extra food along in case the hike takes longer than expected. Plan to stop to feed young children every 45 minutes or so. My children eat much more often when hiking than they do at home. For toddlers and babies have a change of clothes along, plus diapers and wipes if needed. If it’s wet or muddy on the trail, or if you have a child who is drawn to the water, a change of clothing can make a big difference to your child’s comfort and safety, especially in cool weather. 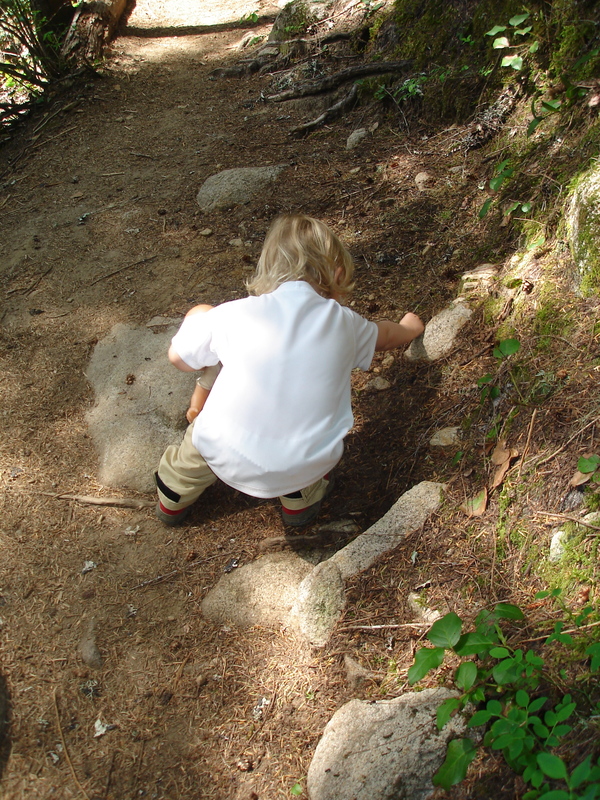 When my kids were crawling, they would get filthy when I let them out of the pack, and I would change them before we started hiking again so they wouldn’t get chilled. Have a map of the area along with you. It’s no fun to get lost or take the wrong trail when young ones are depending on you. Keep it simple in the beginning. Consider doing shorter walks in urban parks if you have the opportunity. This will help you test out gear and shoes, and get your children used to walking or being carried in a pack. Ease into it, especially if you are all out of shape. Remember that it’s about the journey more than the destination. Keep the atmosphere light and fun, and be sure to allow plenty of time for exploring and spontaneous discoveries. Hiking with children is about being out in nature and getting the benefits of the natural world. As they get older they will learn to appreciate attaining that summit or alpine lake, but in the early years you just want them to have fun and get used to hiking as a normal activity. If you have any more tips to share about easing into hiking with children, post them in the comments! I’d love to hear what helps other folks along in the process. I especially love your tip about leaving time for spontaneous discovery. It’s easy to get caught up in going the distance and reaching a goal, but the most beautiful thing about hiking with children is slowing down to see what they see. Love the pictures! Perhaps this isn’t good advice but I often coax my kids along with treats… “we can open the M&Ms when we get to the next switch back” or whatever. Perhaps better advice is that I’m always watching out for things to praise the kids about. I try not to over do it so the praise retains some value, but I want them to feel good about their time in the woods. I also ask them questions to help them notice things and perhaps think about the natural world. For me, letting go of the destination and focusing on the moment at hand was a hard transition. Once I made the change hiking with the kiddos got smoother and they enjoyed it more. Yes! I use those same tips, too. I have used M&M’s, jelly beans (“power capsules”), energy water, cookies, whatever I had to coax them along. Letting them know a rest is ahead is a good strategy for my two. I praise the kids, too, especially my daughter, who seems to have more fears and hangups. I also want them to know when they have completed a genuinely difficult stretch, to give them some perspective on how tough it really was, and yet they did it! I had to let go of my own expectations, too. I still struggle with that, but it was a good, tough lesson for me to learn. Thanks for the comment!